In April, giant rockfish leave their home in the Atlantic Ocean and come into the Chesapeake Bay to spawn in fresh water. 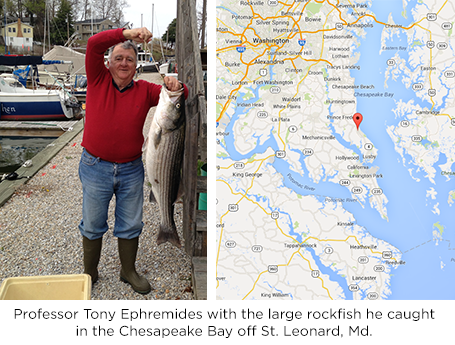 That's good news for those who love to fish, including Distinguished University Professor Tony Ephremides (ECE/ISR). Here's Tony with his weekend prize, a huge, 45-inch, 38 lb. striped bass (rockfish) caught trawling in the mid-Chesapeake Bay off St. Leonard, Md. Dr. Ephremides reports that someone on another boat caught one even larger, "a 55-inch monster!" Tony's no stranger to catching the big ones. Witness the two rockfish he caught in December 2012. Anyone have recipes for blue marlin?